Would you want to see Tour players hit it longer than they do now? Should there be two sets of rules, one for us, the other for them? Should PGA Tour players be allowed to wear shorts? How much golf did you play in 2015, and was it enough? What makes you most optimistic about golf’s future? Sometime after the questions were addressed by the various subjects, our research team realized that the exercise doubled as a sort of inkblot test, GOLF.com-style. It became apparent that the respondents revealed not only their attitudes about golf, but their character too. You soon will be able to hear the responses of the various interviewees on GOLF.com. Below are some of the highlights, with commentary from our research team. Ty Votaw, the PGA Tour’s chief of marketing, is a lawyer by training, and people who have worked with him over the years have noted his ability to identify illogic in any set of proffered words, written or spoken, and exploit said illogic to the Tour’s advantage. But that ability is also capable of sparking humor, of a kind, as is evident in Votaw’s response to Question No. 3, about whether Tour players should be allowed to wear shorts: "In competition, no. In their daily lives, yes." Bob Philion is a young, dynamic, tall and lanky golf-industry executive who embodies the characteristics promoted by his company, Cobra Puma Golf, of which he is president. His manner is both casual and authoritative, and he answered each of the first three questions with a single affirmative word, then offered a full 15 words in his response to Question No. 4., about whether he played enough golf in 2015: "Absolutely not. I gotta play more golf in 2016, and that’s what I’m gonna do." Note the informal use of language: I gotta play. Also, the definitive nature of Philion’s resolution: and that’s what I’m gonna do. Our researchers were struck by his strong statement of purpose. 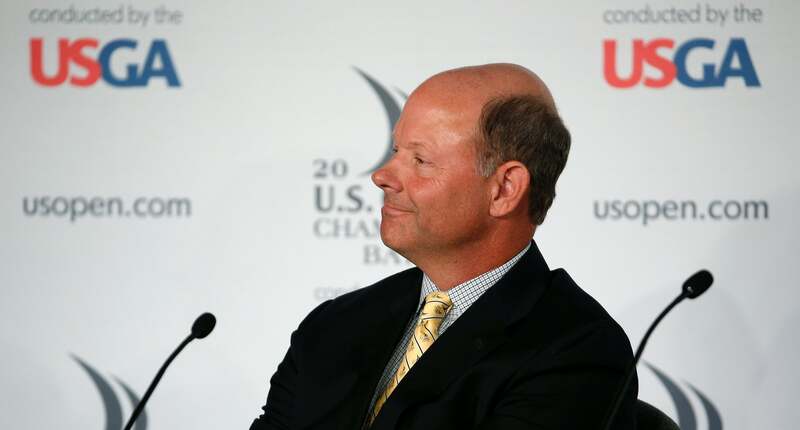 Mike Davis, the executive director of the USGA, is a forward-thinking official who can speak passionately and without pause for an hour about water conservation as one of the pressing issues threatening golf, along with the game’s need to be more inclusive and welcoming to women, minorities and young people pressed for time and pulled in myriad directions. He arrived at GOLF.com’s broadcast headquarters at the PGA Show wearing a blue blazer, of course, and an all-cotton golf shirt with a hard collar that was custom-made, as such shirts are not easy to find these days. Davis is proof that one can be progressive in this game and still defend its most traditional values. Consider his firm answer to Question No. 2, about whether there should be two sets of rules: "No! There should only be one set of rules." He went on to explain his position in nuanced and dispassionate language, but his immediate and instinctive response, our researchers noted, was filled with emotion: No! John Solheim, Ping’s chairman and CEO, comes to golf with an engineering background, as did his father, Karsten, the company founder. When Ping was first making its mark, through innovations in putter and iron design, the ball’s flying ever-greater distances was not part of the company’s ambition. But now driver sales are an important part of its business, as is true for all club manufacturers. Moreover, in Bubba Watson, Ping has one of the longest drivers on Tour under contract. But in response to Question No. 1, about the length Tour players hit the ball, Solheim revealed his scientific bent, focusing not on how far the longest players drive a ball but where the mean is today in driving distance. In golf’s length arms race, that is an issue that is seldom discussed but is central to how competitive golf at the most elite level plays out. On the occasion of Solheim's 70th birthday, the Ping executive had shown another moment of individualistic thinking in a lifetime filled with it. The PGA Merchandise Show is one of the few annual occasions at which the golf industry gathers under one (gigantic) roof. Our research team was impressed by how Ryan Kuehl, an Under Armour executive, seemed have an intuitive grasp of that fact, which may also be explained that he made his mark as an athlete not in an individual sport but in a team one. Kuehl had a 12-year career in the NFL, chiefly as a long-snapper. In response to the final question, about the cause for optimism in golf, Kuehl’s use of the word we is extraordinary, and follows a practice Jordan Spieth, an Under Armour "brand ambassador," often employs, using the same pronoun when talking about what he does on the golf course. In Kuehl’s usage he was referring not, as you might expect, to his company, but to the game -- our game -- that is a pleasant preoccupation, and then some, for so many of us. Here is Kuehl: "What makes you most optimistic about golf's future? The four young players we have on Tour, led by Jordan Spieth, but [also] Jason Day, Rory McIlroy, Rickie Fowler. They're all great kids, great individuals, and they will represent the game very well."